The new laptop arrived on Tuesday, and it’s brilliant. Dual core processor, 4GB RAM, 500GB hard disk – these might not be all that impressive, but after the five year old laptop I was stuck with it runs like a dream to me. And nevermind the specs, my favourite thing about it is that it’s so quiet. I can barely hear the fan at all, so it’s great for watching DVDs – and even the built in speakers aren’t bad for a laptop. The big sharp screen is actually making me wish I’d shelled out for a Blu-Ray model though – and I’ve always been cynical about Blu-Ray! Of course like the big geek that I am, I’ve been playing with my new toy every chance I get. 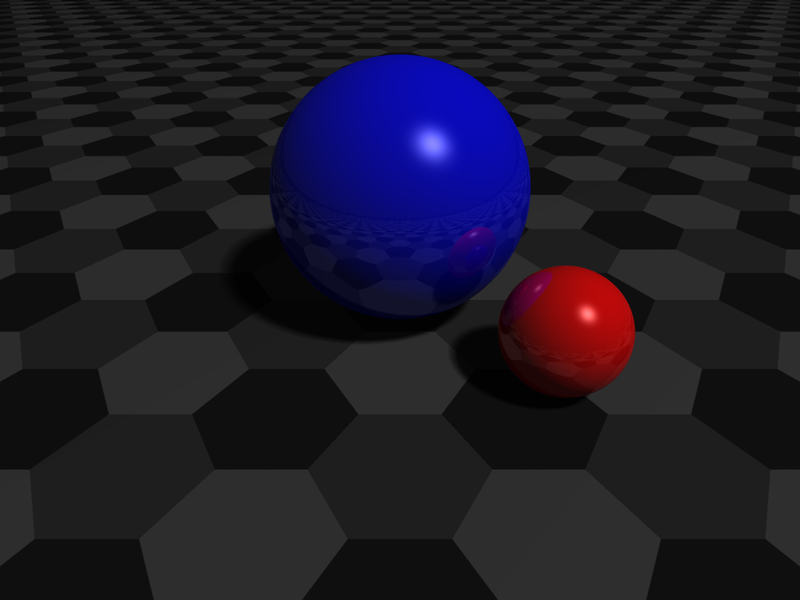 One of the things I wanted to try, which I wouldn’t even have attempted on the old one, is some POV-Ray. Anyway I had a bit of a bash at it tonight, and it’s surprisingly easy to get nice looking results. Here’s something I whipped up and am using as a new desktop (click to see it full size).